I had the huge honor of attending the Oprah's Life You Want Tour stop in Miami this past weekend and had an AMAZING, life changing time. The awesome team at OWN provided me with two tickets, so many thanks to them! Oprah has been my idol since I was old enough to know who she was and the main reason why I decided to go into the TV Production field, so seeing her in person and hearing her speak was so inspiring. I am still in awe and her inspiring words of wisdom were not lost on me. I hope that you enjoy my weekend recap and can take away some inspiration from it! On Friday morning I woke up bright and early to attend the Covergirl & Orgullosa power meet-up breakfast for media and Miami influencers (in the pouring rain). I had such a great time and enjoyed the power panel with Carla Hall from 'The Chew' & 'Top Chef', Jessi Leon a Latin Grammy nominated singer, and Irma Martinez a fashion stylist and entrepreneur. Once the breakfast was over, I got to walk around and visit a few other tents but left after a few minutes because Mother Nature was throwing a huge temper tantrum. 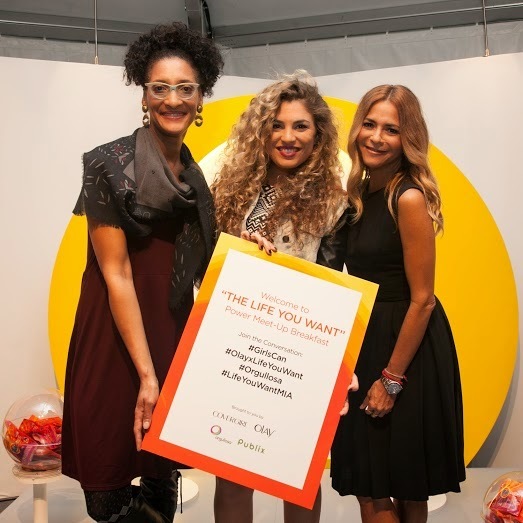 TV Host and Chef Carla Hall, Singer Jessi Leon and Celebrity Fashion Stylist Irma Martinez participated in a Power Meet-Up of influential women, hosted by COVERGIRL, Olay, Orgullosa and Publix, at "Oprah's "The Life You Want" Weekend" in Miami, Oct. 24, 2014. In panel discussion format, the women explored the topic of living one's best life, while sharing words of encouragement, empowerment. Later that evening I returned to the American Airlines Arena for the main event, Oprah!! It felt great that I was able to bring my Aunt with me because she is just as big of an Oprah fan as I am. We got to our seats and enjoyed a dance party with sounds from DJ Kiss and of course, a selfie. At 7:45 PM the music faded out, the light's were dimmed, our O-town wristbands lit up, a brief video bio of Oprah's life was played, and then up from the stage came OPRAH! Oprah spoke for roughly an hour and a half about her life from, literally, when she was conceived (LOL) to her life today and all of the lessons, trials, and tribulations that have come of it. I was mesmerized by all that she shared because I never realized how similar our beliefs and and life stories are. I left feeling like someone hit the delete button on my mindset and filled it with new, positive thoughts. I woke up feeling refreshed, renewed (as cliche as that sounds), and ready for Day 2 of the Life You Want weekend. The day started 9 AM and this time, my mom came along with me. 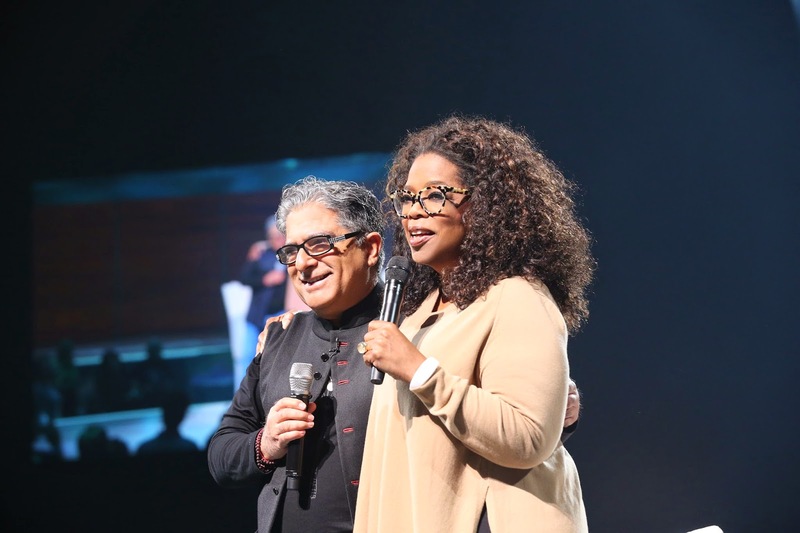 For the first half of the day we enjoyed inspiring stories, lessons, and words of wisdom from the "trailblazers", Deepak Chopra, Elizabeth Gilbert, and Rob Bell. And in between each speaker Oprah spoke and guided though interactive activities with our Life You Want activity book. During our lunch, I headed over to "O-town" to check out the different tents (without it pouring rain) and to see the trailblazers up close and personal at the O-town stage. Before the trailblazers came out, we were treated to a fashion show from Peace, Love, World, the official clothing merchandiser for the Oprah's Life You Want Tour (they're also based in Miami!). Oh, and I went by the O Magazine Lounge to take a peek at Oprah's BFF Gayle King but the real surprise was having my O Town wristband scanned and finding out I won a free pair of pants ($150 value) from the Canada based brand Lisette! They're in the mail, so I will do a review once I get them. After grabbing a meatball sub from Subway (Nom!) we headed back into AA Arena and worked off lunch with a a 'Soul 15' workout with an instructor from Soul Cycle, Stacy Griffith. Once we all broke a sweat Iyanla Vazant graced the stage and spoke about her life and not holding onto the past or letting it take over your present or future. After plenty of laughs, the trailblazers joined Oprah together for one final time to answer questions that were tweeted to them. After a brief break we were introduced to a real life super hero, Amy Purdy, who is a paralympic bronze medalist and a DWTS alum. Amy and Oprah along with Toyota took the time to introduce us to the Miami recipient of the Toyota Standing O-vation. Estella Pyfrom, CEO of Estella's Brilliant Bus, an organization aimed at helping children get access to technology, educational training and empowering experiences. Her story and mission was such an inspiration, there wasn't a dry eye in the house. After we dried our tears, Oprah took the stage to guide us through our last activity and for a final farewell. I can't say how amazing this weekend was, enough! I had the best time of my life and literally FEEL like a different person. As if the complimentary tickets weren't enough, I got this AWESOME gift bag filled with goodies. Top: Free 1 week trial to Equinox, $25 off SPANX, free Soul Cycle class, Pantene Pro V Keratin repair shampoo and conditioner, Oprah's Life You Want Mophie case (AHH! ), Secret Stress deoderant, a brownie, Charmin/Bounty/ Covergirl coupons, and our activities notebook. Bottom: Free 30 day Beats Music trial, Free Uber ride, $75 off Tieks ballet flats, Tide pods sample, Oprah;s Life You Want Weekend planner, Peace Love Oprah tote, Olay PRO X microdermabrasion system (Posting a review on Wednesday. I hope you all enjoyed my recap, I'll be posting all of the inspiring quotes that graced the screen later this week.